I've covered all the Io-related abstracts in tomorrow night's (wait, now tonight's) poster session covering the Galilean Satellites. Yeah, Io got lumped in with *shiver* Europa (in my mind, there are United Nations peace keepers between the Io and Europa poster boards), Ganymede (everyone's second favorite schizophrenic moon), and Callisto (thanks to the discovery of rings around Rhea, Callisto now possesses the sole title of most boring moon ever). So, if you are at LPSC, be sure to visit the poor Ionians as they will most likely shoved along the back wall like they were last year. Please, show them some love. Anyways, I am rambling on here. There is an additional Io-related abstract submitted to the LPSC conference, a print-only abstracted by Glenn Veeder, Dennis Matson, Ashley Davies, and Torrence Johnson titled, "Io: Heat Flow from Dark Volcanic Fields." 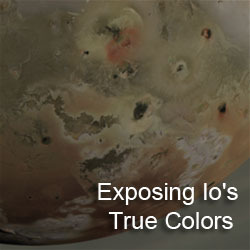 The authors examined the distribution of dark flow fields on Io and examine their contribution to Io's high heat flow (the total amount of heat released in a given time period from the interior). As a print-only abstract, the results presented in this abstract will not be presented at a talk or a poster at LPSC. The authors focused on dark flow fields, areas where lava has flowed across Io's flat(ish) plains, rather than those flows within the topographic confines of a patera. It is thought that these flows are compound pahoehoe silicate lava flows, built up by small outbreaks on top of older flows punctuated by period of high eruption rates that rapidly grow the lava (akin to flood basalts on Earth). They determined that dark flow fields are not distributed evenly across all longitudes with a peak near the center of the anti-Jovian hemisphere (in the abstract, the anti-Loki hemisphere). Flows seen near this peak include Prometheus, Zamama, Thor, Culann, Volund, and Mycenae Regio. This correlates well with a peak in the distribution of volcanic centers and paterae. 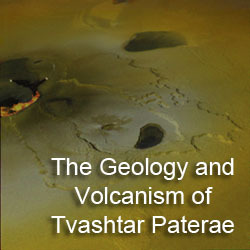 The authors note that a correlation is not seen at the other peak in volcanic centers and paterae near 325° West, which includes Loki. 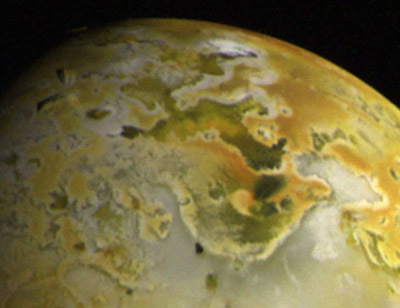 The authors then examined the contribution these lava flows make to Io's total heat flow. 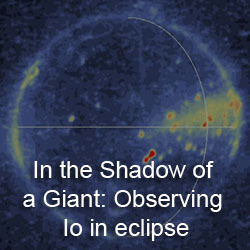 In the abstract, they focused on two prominent flow fields: Lei-Kung Fluctus (shown above, big flow field on Io's northern trailing hemisphere) and Amirani. Using NIMS and PPR data from Galileo, the authors calculated that that the two lava flows contribute 4.5x1011 W and 1.5x1012 W to Io's total heat flow, which is on the order of 1014 W. In total, the 24 flow fields the authors examined contribute approximately 10% to Io's total heat flow, equivalent to Loki Patera. It should be noted that the authors mapped about 3x105 km2 worth of dark flows. This is about 25% of the total amount of dark lava flows covering Io's surface according to the mapping done by Williams et al., so that 10% figure maybe an underestimate. I can't tell, but it also seems like they assumed an effective temperature (basically an average temperature for the entire flow field) to come up with their heat flow numbers for at least some of the fields they mapped. An interesting abstract. I will be interested in seeing how their dark flow mapping compares to what Williams et al. has done (this also sounds like the kind of project that global geologic mapping is suited for), particularly since Williams et al. mapped a factor of 4 more dark flows material than Veeder et al. did. except that it is so close… i’d have to say the most boring moon ever is sadly our own moon. i actually think the biggest yawner among all of the bodies is mercury, but that makes people mad.